And we update frequently to ensure our tools are at their best. BoxCutter is a fully featured Boolean system more powerful than Booltool and Hard Ops combined however goes in a direction that is unique and different. This is not an extension. This is a separate tool. Focused purely on cutting. The features and workflows developed in Hard Ops are intended to streamline and speed up the hard surface workflow. Box Cutter is merely a concept of another idea that was just too big to be just a button in another plugin. There is an extensive roadmap and we have our eyes on some very interesting features. With time and support we can turn this into something that will cut a new slit in the cg world. Developed by AR, MX, JL and endless python mercs. T - Solidify (add thickness to the shape during draw. It's best to show this in action. Even the new inset (purple) is in edit mode. Inset is perfect for curved surfaces due to how it works. Even though it's the most unused / unloved box we intend to to make it better than ever. Using Hard Ops is is possible to get circles to be more controllable. Our goal is to of course make Boxcutter fully capable of solving all of it's own problems. This item has an average rating of 5 from 18 ratings by the community. Makes things quick, that is all that needs to be said. You can set up and do all what the tools do with remodelling our booleans however that will take infinitly more time. With this tool modelling becomes more like hard surface sculpting. For just letting your mind flow and let concepts emerge tere is few better. And non att this price point. COmbine with Hardops for a complete package and just watch your creation speed take leaps. Whether adding tiny details, or altering the whole mesh, that without BoxCutter, and using Blender native booleans, and other modifiers it might take minutes, or depending on what your creating, even hours. With BC, its literally a couple of clicks. Beginner to Blender, or experienced users, this is one of those Add-ons that just grows with you. Because it does so much, (just type "Box-cutter" into Youtube, an see what I mean.) As your experience with either Blender Or BC grows it opens up more and more possibilities. Because of the depth of abilities it offers (point 2) ... Lets put it this way. you know when your working on a design, and you think, "this just isn't right. Or "Not really what I wanted." A lot of features. It's an incredible addon! Great addon, in combination of hardops even better. Excellent addon which not only boost productivity, but is a ton of fun as well, especially when used in conjunction with HardOps. The 2.8 version is much more natural to use IMO and has had no crashes. If I had one criticism it would be that BoxCutter has always been kind of a pain to use with a space mouse type device. I was able to alter previous versions to be more useful with such a device so I could activate a context sensitive pie menu from one of the buttons and not have to go to the keyboard... 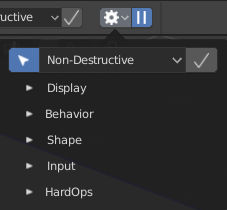 But maybe it's time for BoxCutter to ship with such a pie menu that can be invoked during the cutting operation to allow for bevel, array, flip, cut/slice toggle etc to be done via a pie selection instead of having to hit the keyboard. I think with the freeze functionality it might be easier to implement. In the meantime I shall see what I can hack up because we love BoxCutter and we love our Blackline space mice too. They should be able to make love. 5 stars, plus hardops addon and hard surface modeling is your profession! super addons. very fast to make robot modeling and etc. I am trying it for first minutes and it is absolutely fantastic. Best invested 15$ in my life. With this add on modelling of sci-fi thematics (corridors etc.) is really enjoying. Great for Hard surface and rock formation, How could I have lived without it !!! This is so far, the best Knife Addon Blender ever got. Are you tired of Blender standard Knife tool that is confusing? Well, this addon might be for you!